Dunbarrow Cove is a medium-sized cave south of Anvil containing a home catering to thieves (plugin-specific). This cavern becomes your property after the Dunbarrow Cove quest is completed. It is added by the Thieves Den official plug-in. Dahlia can find the following crew members for hire, much like purchasing a house upgrade. Purchases from Dahlia are done via the Dunbarrow Cove Upgrades dialogue rather than using the standard purchase menu. One implication is that the following prices are fixed and are not subject to haggling. 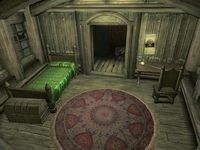 Description: You now have a bed, chest, dresser, cupboard, and better lighting, all located in the Captain's Quarters. This upgrade provides a bed, chest, dresser, and cupboard, all located in the Captain's Quarters. The chest at the foot of your bed contains a Smuggler's Key that opens the door to the Anvil castle Dining Hall in Smuggler's Cave (see the page on Smuggler's Cave for details about where this door leads). This is also where you will find your cut of any loot acquired by your pirates. On the table you will find four lockpicks and a steel cutlass and on the wall is a Gray Fox poster. Description: A salesman with many rare goods. Jak Silver is a male Imperial Nightblade who can be found below-decks on the Black Flag. If your mercantile is less than 50, Jak only sells lockpicks and potions.† At higher mercantile levels he also sells weapons, and armor (including enchanted versions). The potions include Nightmask potions that are only available from Jak. He also provides training in Speechcraft up to level 75. Many other items also become available (for free) in the room belowdecks where Jak Silver is located. Five chests in the lowermost deck of the Black Flag can be used to store loot. Description: A smuggler/fence. Will buy any stolen goods. Description: A housebreaker, will teach you and your crew Security. Provides the security training chest. Tahm Blackwell is a male Imperial who can be found in the northwest corner of the main cave (near the entrance from Smuggler's Cave); he sells potions and scrolls. The only potions he sells are Potions of Magnification that cannot be bought anywhere else. The only scrolls he sells are standard Open scrolls. He also sells several spells, some unique, that provide Fortify Sneak, Security, and Open effects. Tahm provides training in Security up to level 75. The upgrade also includes a Training Chest that can be used to train your Security skill: it has a Hard lock and every time you open it, it immediately locks again. Description: Marksman supplies and training. Melliwin the Mongrel is a female Bosmer who can be found in the southeast corner of the main cave, along with several archery targets. She sells bows and arrows (including enchanted ones; some of the arrows are newly introduced by this plug-in and only available from Melliwin). She also sells several spells, some unique, that provide Fortify Marksman, Sneak, Agility, and Speed, and Soul Trap effects. Melliwin provides training in Marksman up to level 75. Kovan Kren practices his swordsmanship. Description: Has some weapons and armor for sale and also teaches Sneak. Kovan Kren is a male Dunmer Nightblade who can be found in the northeast corner of the main cave, where he is usually practicing Blade skill on the target found there. Kovan sells armor (including enchanted items); he also buys books, clothing, and potions. The armor includes Gauntlets of the Manhunter, Silenced Boots, and Silenced Gauntlets that are not available anywhere else. He also sells several spells, some unique, that provide Fortify Blade, Fortify Sneak, Chameleon, Charm, and Invisibility effects. Kovan provides training in Sneak up to level 75. Zedrick Green (a male Imperial) will join your crew after purchasing two upgrades. Scurvy John Hoff (another male Imperial) will join your crew after purchasing four upgrades. Yinz'r (a male Argonian) will join your crew after purchasing six upgrades. All three are tagged essential (unkillable). Once all upgrades have been purchased, the quest is completed and you will have obtained the ability to send the three pirates who joined your crew out to pillage and plunder. Talk to any one of the three pirates and you will see the topic "I want you to head out and plunder". Select this topic to send them off. After one week you will receive a message saying your crew has returned and your share of the plunder is waiting back at Dunbarrow Cove. Your share is leveled and can be picked up every week in the chest at the foot of your bed in the Captain's Quarters. The amount of gold you receive is 100 times your current level (up to 2000). You can send your crew back out to pillage again one day after they return from the previous mission. You won't get any infamy points for sending your pirates out to plunder. Once upgraded, you can find the Smuggler's key in a chest located in the captain's quarters. This will allow you to open the second door in Smuggler's Cave and enter the castle via the dining hall. 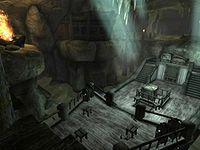 See Dunbarrow Cove Items for a list of items added by the Thieves Den plug-in. Any container in the Captain's Quarters. Any container in the bottom floor of the Black Flag. The chest supported by two crates next to the training chest. The barrel at the far end of the long bridge, next to where Melliwin hangs around. The torn sack of grain where Jak Silver sleeps. The various spells sold by the merchants include multiple spells with the rare Fortify Skill effect; these are the only standard spells available with this effect. All of the merchants (not just Khafiz) will buy stolen goods, although the others only have 100 gold (rather than Khafiz' 1500 gold) to spend. Your new advanced trainers will not provide the reference for master training. The name "Umbranox" is referenced to in Cap'n Dugal's journals. Moreover, "Umbranox" is the name of a Captain who defeats Dugal and his pirates, and Dugal states that he expects that Captain Umbranox returned to the Imperial City to be rewarded with titles and land. "Umbranox" is the last name of the Count and Countess of Anvil in the game, so one must assume that Captain Umbranox was rewarded in this manner. And indeed, this is confirmed by Bethesda on the Thieves' Den's official page in the online Oblivion store. The Black Flag is mistakenly called the Red Sabre on some promotional texts. Note that all of the Cove's inhabitants will speak and trade spells with you, but they will only buy and sell items during the regular shopkeeper hours. The inhabitants may randomly decide to attack other occupants of the cavern. See their respective pages for details on how to deal with this problem. There is a glitch with the doorway between the entrance and bedroom of the Captain's Quarters in Dunbarrow Cove, where items you drop can fall through the floor. Smaller items can be quite hard to retrieve, you might have better luck with larger objects such as shields or other armor. This page was last modified on 13 July 2018, at 02:48.